Schedule advisor meeting after November 5. During that meeting your advisor will give you a PIN that will allow you to sign up for classes when you are eligible. Verify that you do not have any holds on your account. If you have a hold from any department, including financial aid, student accounts, admissions or security, you will NOT be permitted to register for classes. You can log into the Empower program online and any holds from these departments will be listed on the Welcome screen. It is your responsibility to clear up the holds that have been placed on your account. Spring/Summer 2019 grads must have their graduation applications submitted by December 1. Contact the Registrar’s Office with questions. 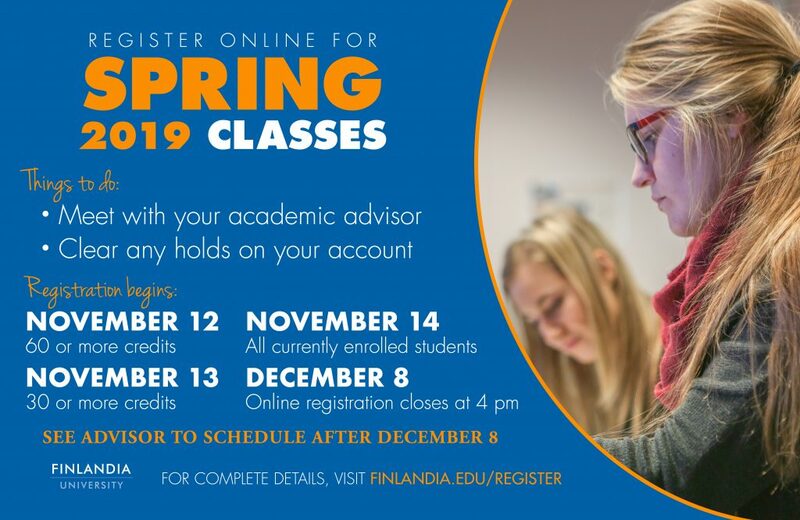 All information regarding registration can be found at finlandia.edu/register.